Question: How does a train know where to go? This question comes up a lot, and although I’ve answered it in comments or emails or Twitter, I’ve never given it its own post. 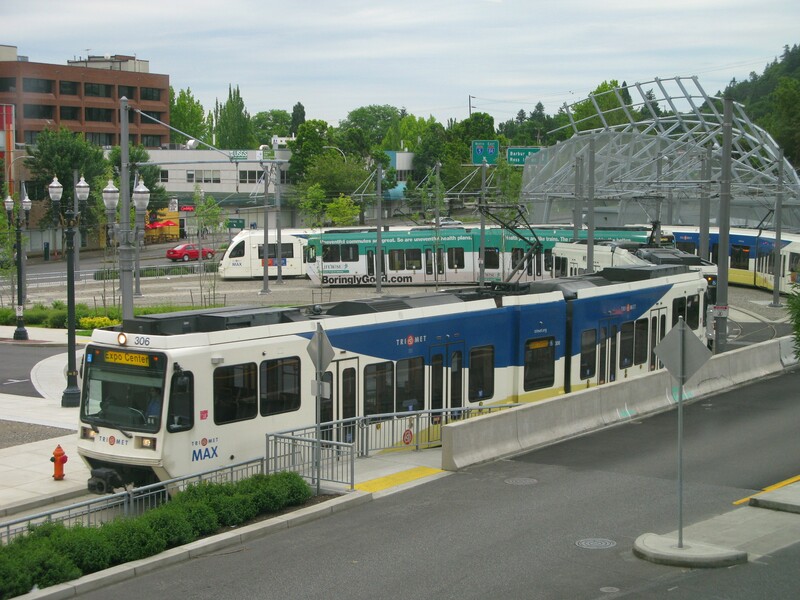 But a lot of people have asked, for example, if a train is eastbound at Gateway, what do you do to it to send it to Gresham vs the airport vs Clackamas? Sure you call the signal but how do you get the right aspect(s) to come up for where you want to go? It’s not like the trains have a steering wheel. In the cab of each train is a place to set the train number (under normal operating conditions, this won’t change over the course of the day) and also the route code. The train number is the train’s identifier, and it matches the number visible in the window box – for example, the train in the old header picture of this blog was train 40; the train in the old background image was 71. If Control wants you, they’ll call your train number over the radio. If you need something, you begin a radio call to Control by stating your train number. You can tell what yard a train is from (though not necessarily what yard the operator is from due to reliefs) and what color its route is from the train number. Trains 1-15 are Blue originating out of Ruby, 20-38 are Blue out of Elmonica, 40-53 are Red out of Elmonica, 60-74 are Yellow/Green out of Ruby, and the Mall Shuttle had been train 89 out of Ruby. Trains not regularly scheduled, such as those used for testing or burn-in get numbers in the 90s. There are some exceptions to this breakdown, like train 10 is Blue most of the day but becomes Red at night, 43 begins its day going from Elmo to PDX to Hatfield before becoming a regular Red Line, but this is all pretty much just trivia for passengers anyway, it’s not like I’m going to quiz you on this later. The route code is what tells the train where to go from its current location. 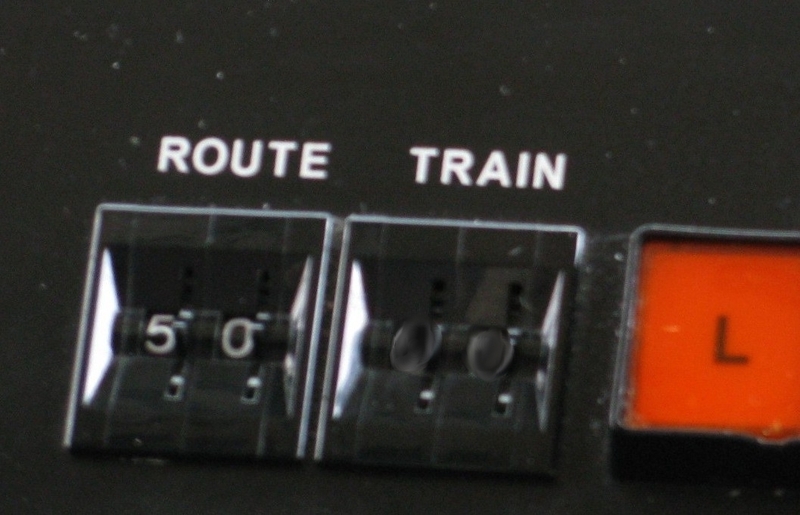 Every possible destination on the alignment that can be reached via power switches has a route code assigned to it – not just the ends of each line, but also the yards, sidings, pocket tracks, etc. 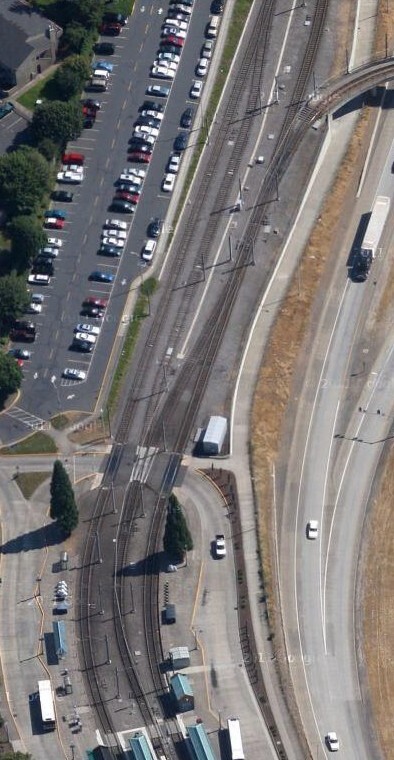 In the first picture in this post, a route code of 50 will get a train to either track 1 or 3 in the Jackson turnaround by PSU, whichever is open. Every time an operator places a train-to-wayside call over a call loop, the switches will be set to move the train toward the destination set as the route code, and the corresponding signals will be displayed. Operators are responsible for ensuring the route code is correct for where the train is supposed to go. For Blue and Red line trains, this is pretty easy – the cab that leads going east will be set for Gresham or PDX, and the cab that leads west will be set for Hillsboro or BTC so it does not need to be adjusted frequently (well, it’s easy as long as Red line operators don’t forget to change the route code from the BTC pocket track on the last trip and end up in there when they need to keep going west…). Yellow/Green line trains are a little trickier. For trains leaving Ruby to service those lines, depending on which run it is the route code will be set for Expo, the Jackson turnaround, or the Gateway auxiliary track (where the operator will swap cabs and take the train to Clackamas). Then to change color at Jackson, the operator will leave Clackamas (for example) with the route code for the Jackson turnaround, and then once there will set the route code for Expo. When leaving Expo in the other cab, they’ll set the route code for Jackson, and then once in the Jackson turnaround, they’ll change the route code for Clackamas. Potential errors can happen if an operator forgets to change the route code from 50 when leaving Jackson (if that happens, the train will head back south to PSU from Union Station instead of crossing the Steel Bridge) or forgetting to set the route code for Jackson from the end of the line (so for example, heading toward Clackamas from Interstate Rose Quarter instead of over the Steel Bridge). The number of aspects that are lit indicates which route you’ll be going on (one aspect = primary route, or “A” route. Two aspects = secondary route or “B” route. Three aspects = tertiary “C” route, etc). As an operator, when you’re looking at a signal that can display more than one route, you need to know which of those routes corresponds with the route code you have in your thumbwheel. 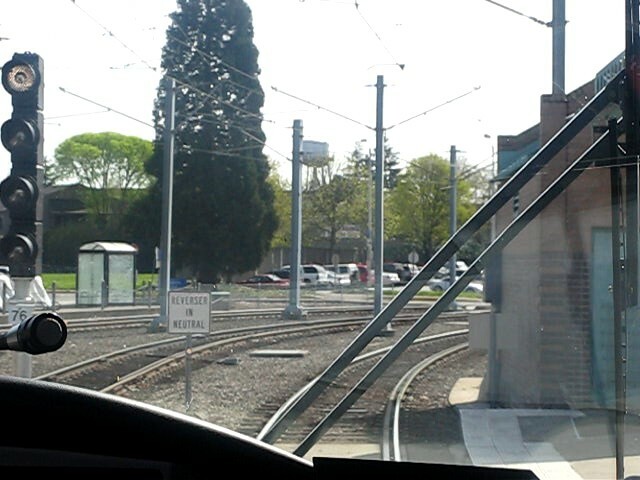 For example, at the ends of the lines (here into Cleveland Ave from Gresham TC) a single yellow aspect will actually put you over diverging switches into Cleveland, but a red over yellow is a straight shot in. A signal with two aspects means that you’re diverging from the primary route, but not necessarily diverging over switches – it could be that the primary route itself diverges over switches but the secondary route goes straight. I had been thinking about the ABS signals in terms of switches, not routes, and that was a stumbling block for me. 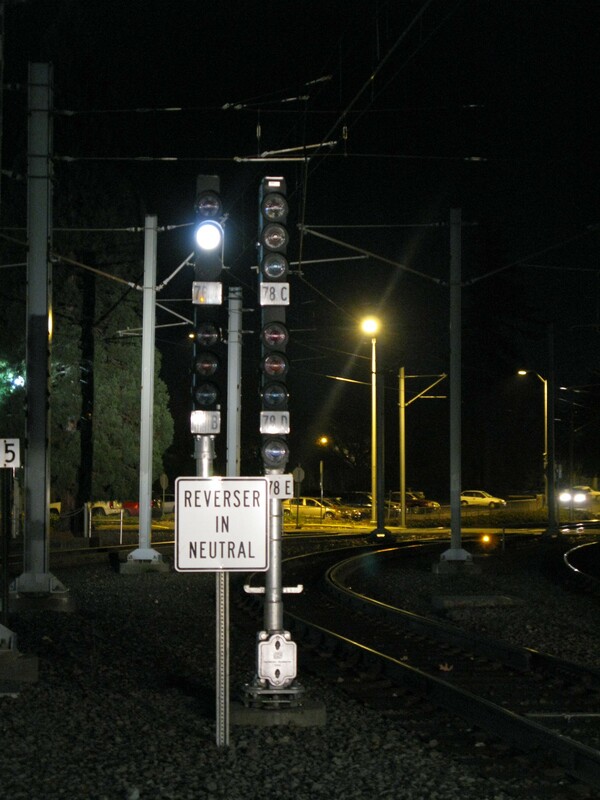 A permissive signal indicates that your switches are set for whatever your route code is, but you have to know if that means they’re diverging or normal. Same with this red over white vertical on W1760 at Hatfield – it’s a secondary route (2 aspects), but this train will be going straight in, not diverging over the switches. Sorry for the blurry picture but it’s the only one I have.. I either need to go out there and get a clearer one or get someone to do that for me. Both trains that called these are facing east at Gateway – the one looking at signal 76 is in the eastbound main; the one looking at signal 78 is in the pocket track. Both have a route code set for Clackamas TC. And from both tracks, that’s the “C” route / 3rd route / tertiary route, which is why both signals are showing 3 aspects. These aspects are almost functionally identical (the yellow on 78 just means that this train’s leader is only one ABS block ahead of them, otherwise that would’ve been a green) even though the train observing signal 78 has two more sets of switches to diverge over to get to the eastbound main to get to Clackamas. The platforms are in the bottom of the picture – from left to right, that’s the westbound mainline, pocket track, and eastbound mainline. 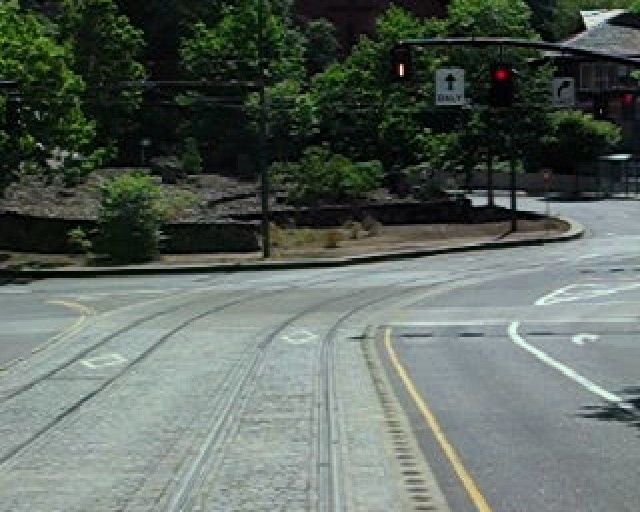 Notice that to get over to the eastbound main alignment (which, out of range of the top of the picture, diverges off to Clackamas) a train in the pocket track has to pass over the switches that could otherwise bring it to the auxiliary track, and then over another set of switches to join the eastbound main. 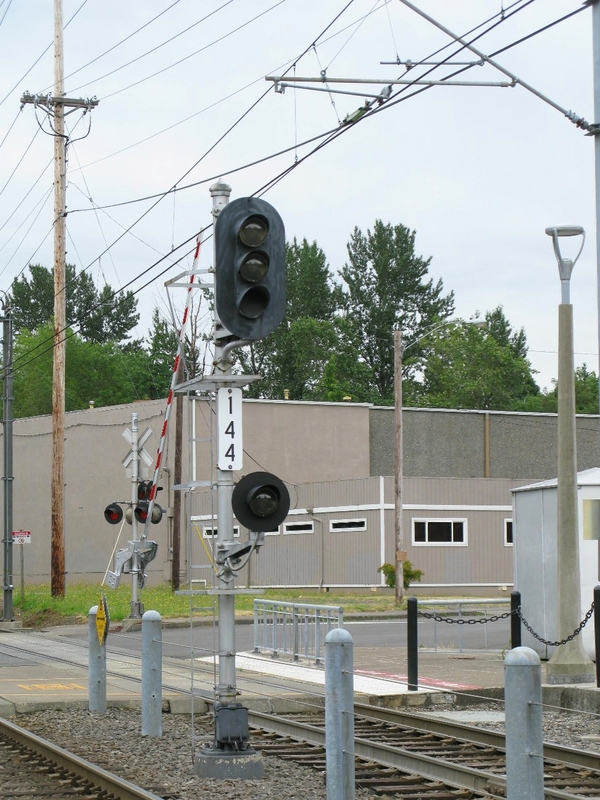 Yet its signal aspect at Gateway to get to Clackamas is identical to what a train in the eastbound mainline would get, even though the train in the eastbound mainline doesn’t have to worry about those switches. Where a train is starting from doesn’t matter – where it’s heading is what will be displayed on the signal. 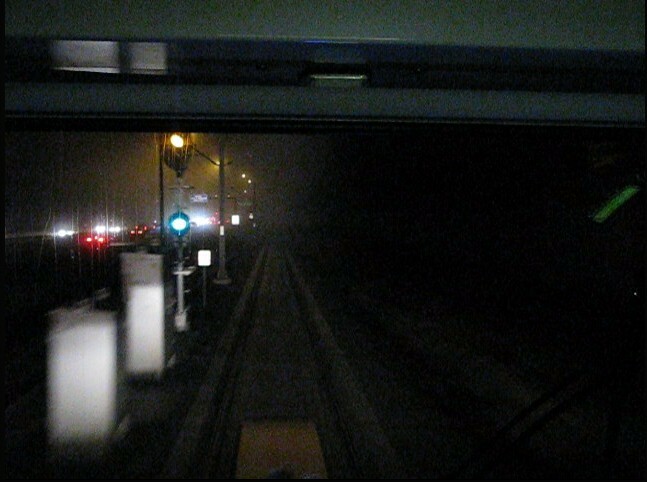 Here’s another example, eastbound at Beaverton Transit Center. Signal W760 is for a train in the pocket track (which is typically a Red Line), and W754 is the signal for the eastbound main. A train heading east from the pocket track will have to diverge over switches to get into the eastbound main, yet the ABS signal will show a single aspect indicating the primary “A” route. It doesn’t matter where the train is at, it matters where it’s going – and for trains in either track here, the only place to go is the eastbound main (primary route), therefore both signals have a single head that can only display a single aspect. There is no choice of route from either track, even though you will be diverging into the main eastbound track if you are leaving the pocket track. On the other hand, if you’re headed west into BTC, you do have a choice of two routes (along the westbound mainline or into the pocket track), which is why signal W556 at Sunset and the intermediate signals leading into BTC (W616 and W716) can all display one or two aspects for a primary or secondary route. The signals will indicate that the switches are set for whichever of those route codes you have in your thumbwheel. You know, I don’t know how to end posts. I feel like I should assign a 2-page essay on the importance of ensuring you have the right route code in your thumbwheel and how that relates to ABS signal aspects. Show your work. In my last post about the mall, I mentioned how the intersections on the mall have secondary call loops, that is, call loops that are not located at a platform. Normally, operators don’t need to use these because the signals will be cascading from when the pre-empt at the platform was called. 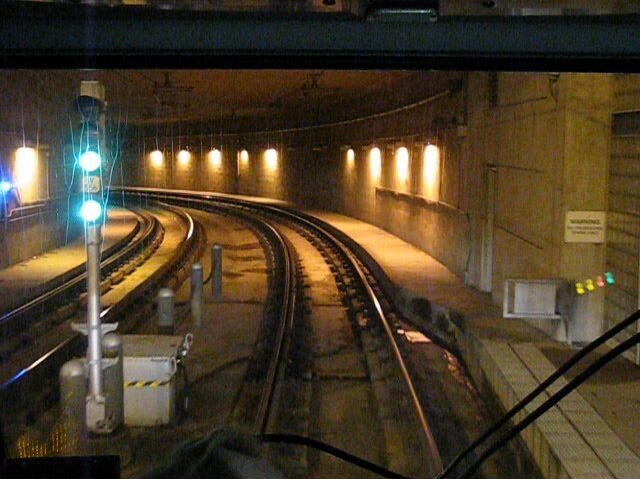 Secondary call loops are there to be used if the signal times out before the train gets to that intersection – they allow operators to quickly recall the signal to keep moving. That’s not the only way to get a pre-empt again – as I’ve mentioned before, some intersections are equipped with a push button, where an operator can reach out of the cab window and use the push button to recall the pre-empt. However, not all pre-empted intersections have push buttons or secondary call loops. For example, on most of Burnside (which uses mass detectors instead of call loops) a train cannot get a permissive signal again if the pre-empt times out or fails to display a white vertical. Continuing through the intersection on a yellow horizontal is the equivalent of running a red light for a train – it’s a rule violation and it’s dangerous. So if it should happen that a pre-empt times out or fails to change to a white vertical in the first place, and an operator has no secondary call loop or push button, there is a set standard operating procedure (SOP) to safely proceed through the intersection. If you’re listening to the radio and you hear an operator requesting permission to SOP the intersection, what they’re asking for is clearance to proceed on a yellow horizontal. First, the operator has to stop the train before entering the intersection on a yellow horizontal. Next, they call Control for permission to SOP the intersection. If it is an intersection that can be safely SOPed*, Control will tell the operator to wait for a fresh parallel green and walk sign. Where applicable (e.g. on Burnside) the operator will also have to wait for a red left turn arrow. 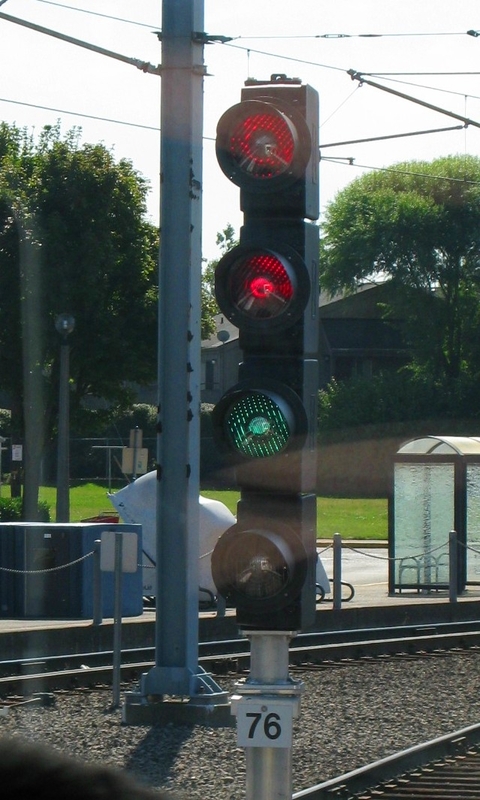 When the auto traffic lights have a parallel green and red left turn, the rail operator will sound horn warning and proceed when safe. This includes checking for emergency vehicles. 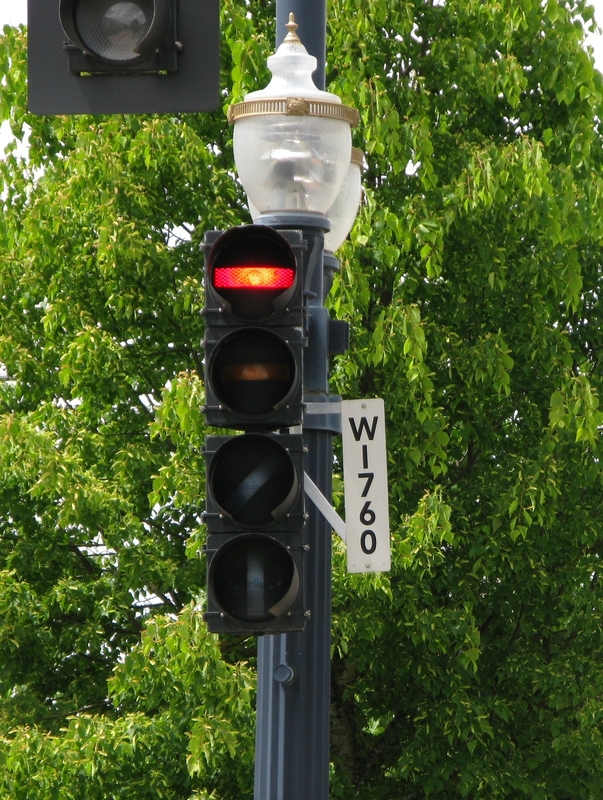 As seen from 2005, an emergency vehicle’s Opticom can’t make a white vertical go back to a yellow horizontal, but if they placed their call before you it will prevent a white vertical from coming up at that intersection. Train vs Fire Truck, Hillsboro, 2005. 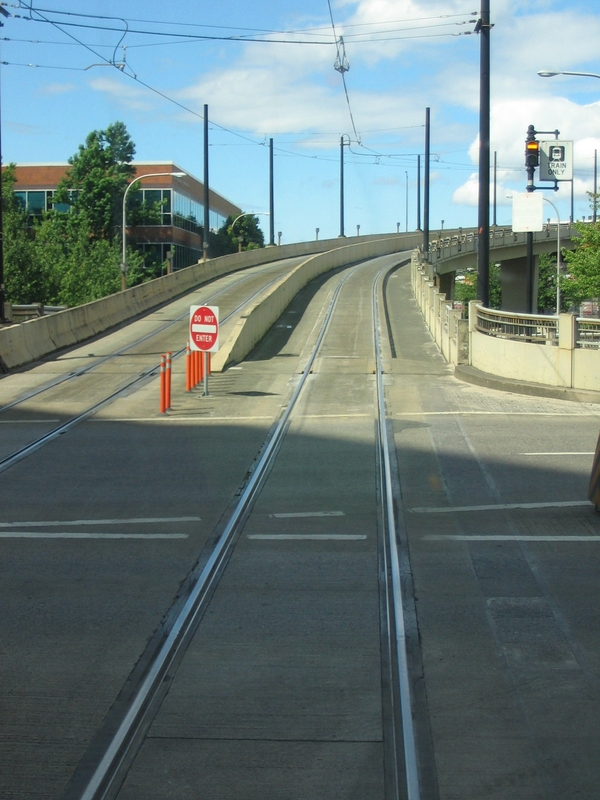 When going eastbound off the Steel Bridge into Old Town/China Town there is a box with a button at cab height… what does this do? 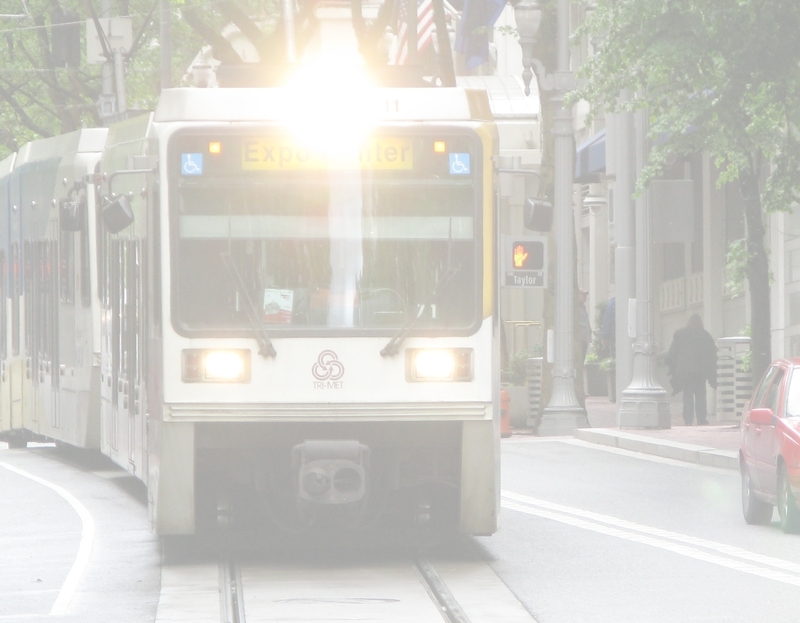 A lot of areas of the alignment, such as the transit mall on 5th and 6th, Interstate, and Washington Street in Hillsboro have secondary call loops that a train can stop over to re-call their pre-empt if it times out. Another way an operator can get their pre-empt is at push buttons like this one (also seen in other places on the alignment such on Burnside near 97th Ave before Gateway and at 197th by Ruby Junction). They work kind of like a crosswalk button where an operator can reach out of the cab window and hit the button to get their signal. 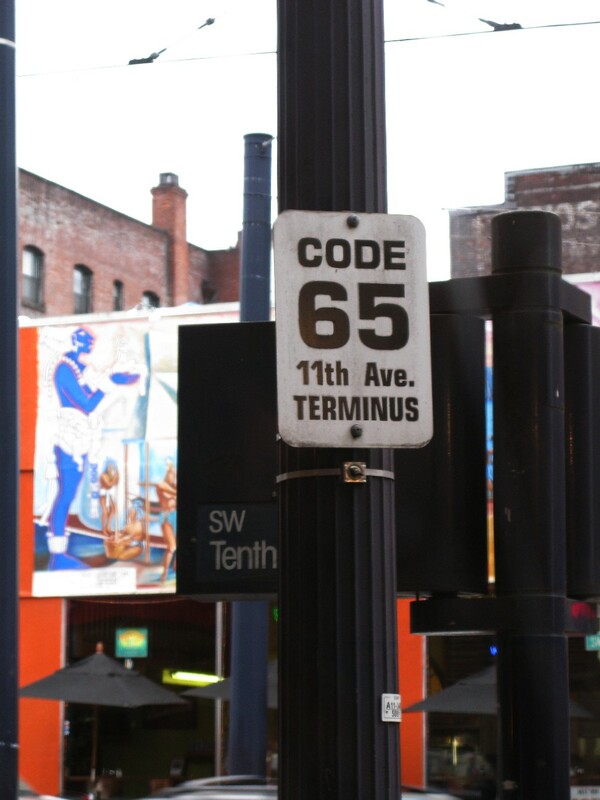 This one was put there for an operator to recall the pre-empt if they came over the Steel Bridge and their leader was still in the Old Town/Chinatown platform. 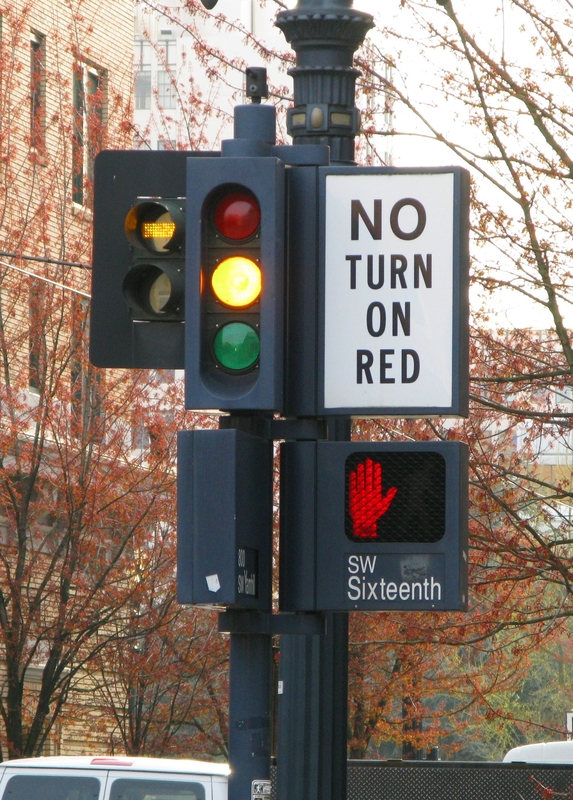 At intersections that don’t have a secondary call loop or push button, an operator will have to call Control for permission to proceed through an intersection, also known as “SOP an intersection” when they don’t have a permissive pre-empt to continue. Posted in alignment "what is?" I’ve been looking at videos of the Shinkansen (the Japanese Bullet Train) on Youtube. I’ve never been to Japan, but if I ever get the opportunity to go, you can bet I will make it a point to ride the Shinkansen. More than once! If you watch the videos, you’ll see the operator pointing at a lot of things. I think the pointing is fascinating – as best as I can tell, they’re trained to point at signals and speed signs. I wonder what the reasoning is behind that – to keep them from going on autopilot? To ensure that they know where the signals and signs are? So that they can’t use “I didn’t see it” as an excuse if something happens? It’d be interesting if they tried to implement something like this at TriMet. I don’t think it’s necessary (we have the ATS magnets which will stop the train if an operator tries to go past an ABS signal that doesn’t have an indication to proceed). But it’s an interesting approach to staying alert – I know during training, new operators will be quizzed while operating (“What was the aspect of the signal you just passed? So what will the next signal be? Will there be another signal between you and the next platform?” etc) that help the students learn where to watch for signals on the alignment, and some students will continue to talk through those locations as they learn. But beyond that, there’s nothing like the pointing at signs or signals like the Shinkansen operators do. Kind of looks like instructions for a line dance arranged this way. Try this at the next wedding you go to. MAX operators follow hand signals, but unlike the Shinkansen operators, don’t really give them while operating (and a friendly wave to the operators of trains or buses you pass doesn’t count). Rail hand signals are one of the first things that operators are trained to do – by the end of day one we could all demonstrate & understand the hand signals for stop, stop at a particular spot, proceed, reduce speed, proceed AT a reduced speed, and back up. And we learned how to acknowledge those signals from inside the train to let the signaler know we understood. 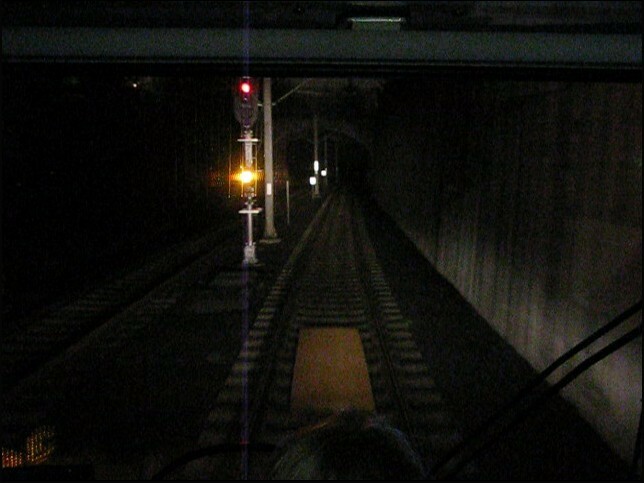 For the most part as a passenger, you probably won’t notice anyone giving hand signals to the train that you’re on, though sometimes you’ll be able to see workers in the right of way giving a proceed sign (“while facing the operator, raise and lower the arm vertically alongside the body”) to a train. One of my first experiences with hand signals outside of the classroom (not counting workers in the right of way telling me to proceed) was on my last trip of my last day of line training – Control called my train to inform me that there had just been a car accident not far past a few platforms ahead of where I was. A car had crossed into the right of way and was stuck inches from the westbound track, and I was going to be the first westbound train through there, so I had to call Control for further instructions before leaving the platform closest to the accident. My line trainer said he was comfortable letting me handle this if I wanted but he’d take over if I didn’t feel up to it. I told him I wanted to do it, so when I got to that platform (and called Control telling them that I was there! ), I left at walking speed and stopped where a supervisor on the ground told me to. Then I proceeded very slowly on his signal, reducing my speed even further as directed via hand signals while another supervisor checked alongside my train by the car to make sure there was clearance for me to keep going. There was *just* enough room for my train to pass without making contact with the car at that slow speed – the natural sideways sway of the train at full speed would’ve probably hit the car. I had been running several minutes late (due to a mistake on my part when I had been westbound at Rose Quarter, I timed my calling my signal wrong and it timed out back to a red before I got my doors closed) and I was far too new to be able to make up for that lost time and get back on schedule – in fact I think I fell even further behind schedule. In retrospect I’m glad I was late, because if I was on time, that car might’ve crashed into me had I been going through that part of the alignment at the full speed. Upcoming posts – more in-depth descriptions of the train cars, the overhead catenary systems, and a list of questions from one of the readers here. So that should keep me busy for a while! 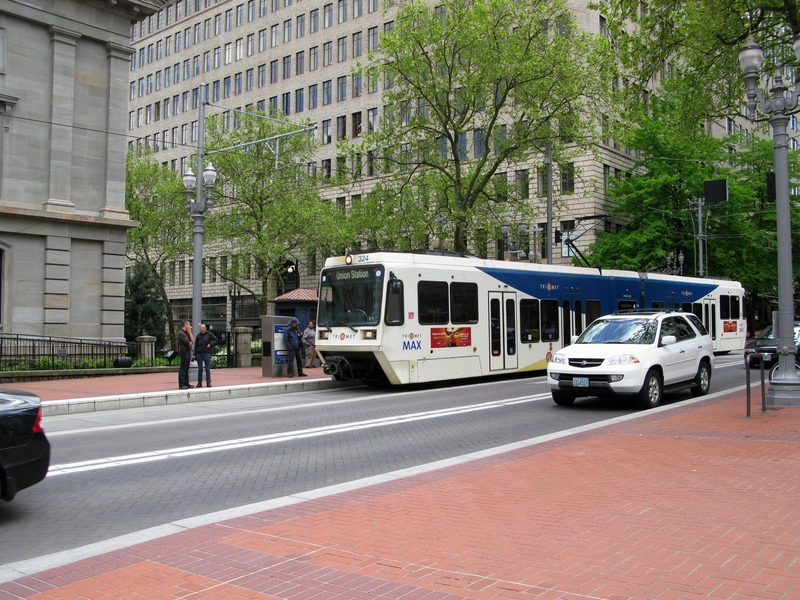 This is an old picture, taken back before the Portland Transit Mall was integrated to have the the Yellow and Green Line trains running on 5th and 6th. 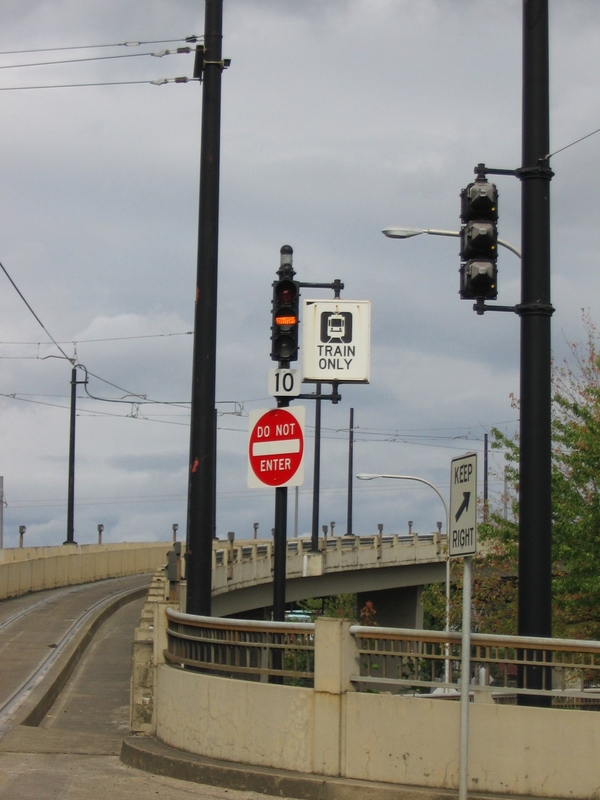 That pre-empt signal isn’t there anymore – the way this used to work was that an eastbound train at Old Town/Chinatown would call their pre-empt and then begin to proceed up the Steel Bridge on a proper signal. Signal 10 (which I have no picture of) was located on the bridge prior to the span, displayed a red or a lunar, and was associated with an ATS magnet – so if, for example, the bridge was going to be lifted, signal 10 would be red and the magnet would be active. But then the Portland Transit Mall happened, and that meant tracks approaching the bridge from a different angle where the Yellow and Green trains go across the river from Union Station and now the added possibility of a Yellow or Green train making a conflicting move to a train at Old Town/Chinatown heading east. So now Signal 10 is a combination signal located where this pre-empt was, and Old Town/Chinatown has an ATS magnet. I forget specifically when this change happened – in 2008 I think. 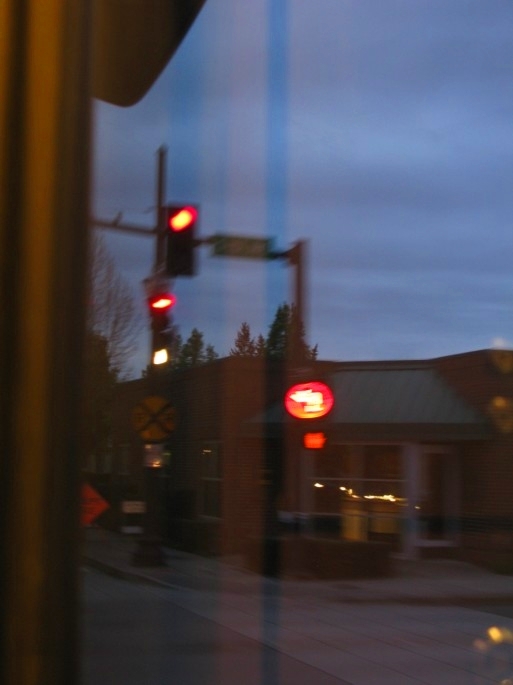 The new Signal 10 – here the train operator has called it, but doesn’t have pre-emption of the intersection yet. 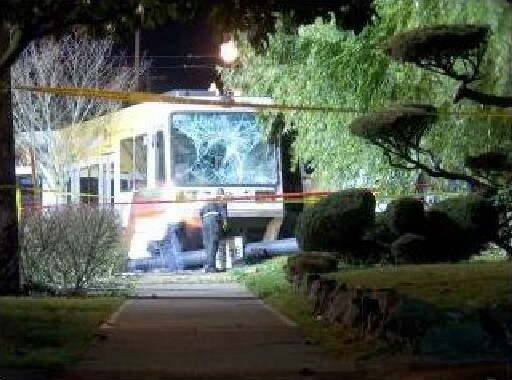 So there’s a little bit of TriMet rail history for you.